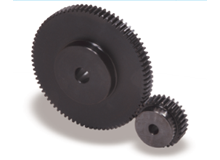 For over 80 years, Kohara Gear Industry has been known for their world class metric gear products. Recognizing the demand that still exists in the USA for diametral pitch spur gears, KHK USA is now offering made to order 4DP, 6DP, 8DP, and 10DP spur gears in both 20 degree pressure angle and 14.5 degree pressure angle varieties. Please contact us today with you requirements for Diametral Pitch Spur Gears.